Heat gas or charcoal grill. In medium bowl, combine ground beef, salt and pepper; mix well. Shape mixture into 4 (1/2-inch-thick) patties. When grill is heated, place patties on gas grill over medium heat or on charcoal grill 4 to 6 inches from medium coals. Cook covered 11 to 13 minutes or until meat thermometer inserted in center of patties reads 160°F, turning once. To toast rolls, during last 1 to 2 minutes of cooking time, place rolls, cut sides down, on grill. Spread cut sides of rolls with mustard-mayonnaise sauce. Place patties on bottom halves of rolls. Top each with onion, tomato, cheese, basil and top half of roll. Double up on the amount of ground beef patty ingredients, then make 4 extra patties for the freezer. Wrap each patty individually in plastic wrap, and store them in a resealable plastic freezer bag. When it's time to grill again, just thaw the patties in the refrigerator and grill as directed. 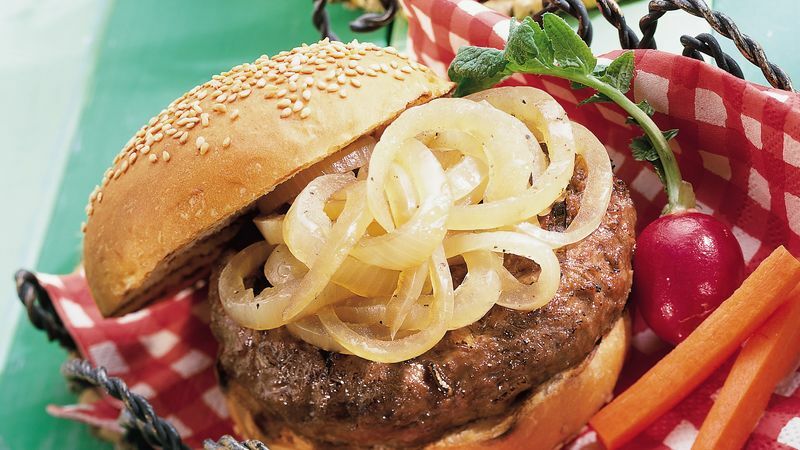 Broiled Bistro Burgers: Place patties on broiler pan; broil 4 to 6 inches from heat using times above as a guide, turning once. To toast rolls, during last 1 to 2 minutes of cooking time, place rolls, cut sides up, on broiler pan.